The outstanding players in the history of chess were dominating their eras in their very individual styles, which was also reflected in the way they tactically concluded their games. Now you have the opportunity to follow in the world champions’ footsteps - with this unique collection of combinations! 88 times, IM Oliver Reeh leads you step by step through the most brillant game conclusions of the world champions - in interactive Fritztrainer format, enabling you to enter the winning moves yourself. If you are stuck, a little hint will give you all the help you need to find the solution. From powerful mate attacks to dynamic middlegame solutions to tactical finesses with only a few pieces - apart from pleasure, solving all these top combinations will definitely give you a huge boost for your own chess practice! The selection naturally includes classics like Capablanca’s neat “Petites combinaisons”, Fischer’s amazing victory as a 13-year-old over Byrne (1956) and “The pearl of Wijk aan Zee” (1999), where Kasparov chased the black king across the whole board up to the square d1. Yet Reeh also presents less well-known masterpieces from the works of the champions - deep, spectacular, stunning, or just beautiful and inspiring. 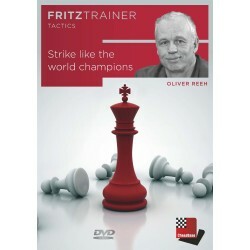 Discover the world champion in yourself, with the finest combinations of the Master Class series (Lasker, Aljechin, Capablanca, Tal, Fischer, Karpov, Kasparov, Carlsen) - all on a single DVD!